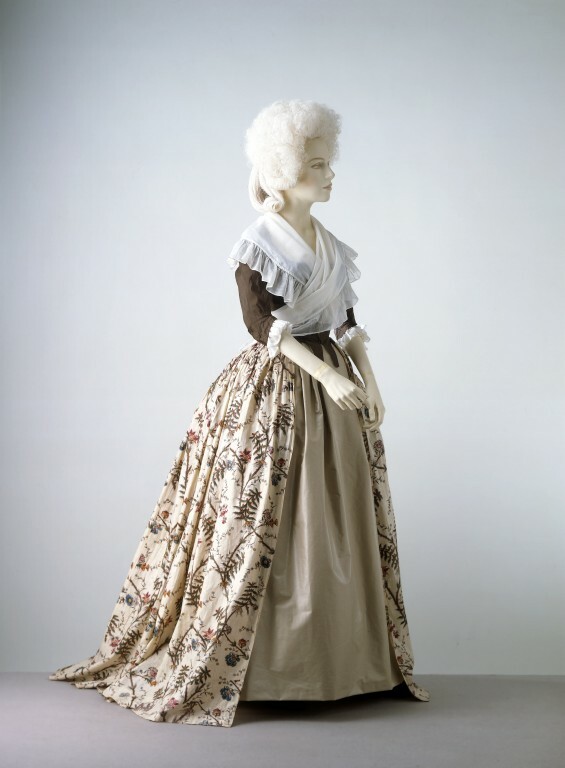 This 1780s gown has a skirt of printed cotton and a silk bodice. This makes it look like two separate garments, although the two are sewn together. The cotton is printed in a pattern of pine trees, lilacs, dianthus, convolvulus and daisy trails. Like most gowns of the decade, the bodice is tight fitting at the back and closes in front. 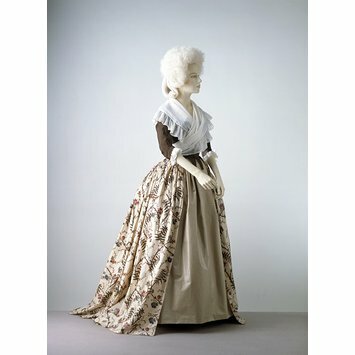 The round shape of the skirt is typical of the 1780s. A woman's gown consisting of a brown silk bodice and a skirt of glazed white cotton block-printed in a large-scale pattern of spring stems in brown with pine trees with roots and cones, lilac and pink pinks, blue convolvulus and small daisy trails. The gown is open at the front, with shaped, elbow-length sleeves, with a band of silk at the openings. The back is made of 4 shaped pieces, tapering to a point at centre back below the waist. The bodice fronts and back pieces are lined with linen and stitched together; the sleeves are also lined with linen. Two bones, running from the bottom of the bodice to mid-back, are stitched into the lining; one on either side of the centre back seam. A line of stitching in the bodice front lining, below the neckline, forms a casing for narrow, linen tape drawstrings. The skirt is made of 3 widths of the printed cotton, finely flat-pleated in pleats of two, into the waist seam. There are pocket openings cut in the skirt on either side and bound with narrow linen tape. The skirt is pieced at the front hem. It is possible that it is a replacement for an original skirt of brown silk, although the waist seam is sewn with the same brown silk thread of the bodice.